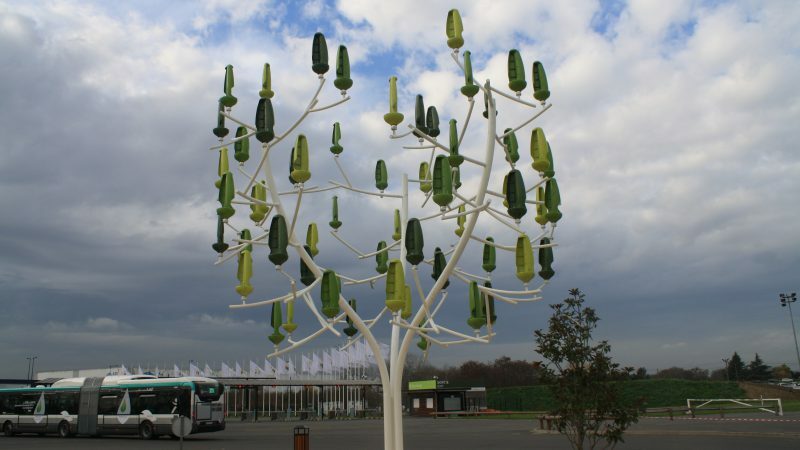 Here is one of two experimental tree-like sculptures in Paris that efficiently captures multi-directional wind gusts with vertical wind turbines, and converts them into electricity. Some researchers suggest such vertical micro turbines will be the solution to reducing the large footprint and noise of the huge high-capacity wind turbines. At present, such trees are significantly more expensive to install and maintain that are equivalent capacity solar panels; however, individual turbines can be installed in small spaces that would be impractical for solar panels. Micro wind turbines will probably become more competitive as standardization and large-scale manufacturing reduce production costs.